We are all quite rightly concerned about the increasing privatisation and fragmentation of the NHS in England happening under our noses. It is an affront to a publicly funded system that private companies may swoop in and profit from delivering an essential service. The gradual privatisation of the NHS may be a complex subject, but it is there – quiet and deliberate. It is something we can all see happening and must communicate to others. However, the government’s latest attack on a publicly owned and provided health service in the form of Integrated Care Providers (ICPs) is less easy to understand and consequently far less easy to oppose. This is no accident. The public sector has always loved its acronyms, many of them have slipped into general usage and become widely understood. However, how is one to understand and use a term that is constantly changing? One that alters its name seemingly every few months in an effort to simultaneously bewilder and bore the general public? Easy to understand or not; health policy and legislation is never going to grab the public’s imagination, it is not exciting. However, the implications for our NHS matter greatly. Accountable Care Organisations (ACOs) are an American initiative first talked about in the UK around March of last year. ACOs represented the evolution of STPs (Sustainability and Transformation Partnerships), which by the way began as Sustainability and Transformation Plans, but were renamed after campaigners exposed the fact that they were a vehicle for cuts to NHS services. ACOs were presented in England as a way of outsourcing contracts for all of a large geographical area’s health and social care to a single (possibly private) provider for 10-15 years through secretive regulation changes. This would mean no public accountability if things were to go wrong; Accountable Care Organisations are therefore not accountable, and arguably do not care. The term would seem to be a perfect example of Orwellian ‘double-speak’ in action. In December 2017 KONP’s Professor Sue Richards, Dr Colin Hutchinson and Professor Allyson Pollock were among the five Claimants that took NHS England and Jeremy Hunt to court over their plans to introduce ACOs into the NHS. 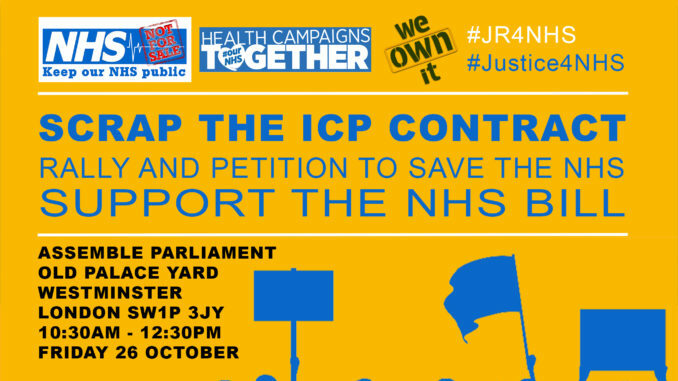 The public and members of NHS staff managed to crowdfund an impressive £180,000 to fight the judicial review case at the Royal Courts of Justice. A media campaign was very successful, not least due to the high-profile involvement of the late professor Stephen Hawking. Facing the prospect of judicial defeat, Jeremy Hunt dropped, his regulation change ploy and conceded that public consultation was required. Then, as a result of the legal battle the court ruled there must be transparency around the introduction of all future legislation. Although the case did not achieve the withdrawal of the contract plans, the fact that there must now legally be more accountability is a vitally important concession and the victory in this area must not be underestimated. Earlier this year accountable care systems and organisations (ACSs and ACOs) were renamed integrated care systems (ICS) and integrated care providers (ICPs) by NHS England in response to the success campaigners and the high-profile court case had had in so toxifying the message. The latest term being used is Integrated Care Providers (ICPs) which is specifically used to refer to the provider who manages the contract. Some things have changed as a result of the campaign and legal pressure. But essentially the repackaged terminology fuels the ‘smoke and mirrors’ approach designed to disguise the core, serious dangers ICPs bring to the NHS. KONP have written about this many times in an effort to make the inaccessible a little easier to digest. So why the endless acronyms? Why the constantly changing terminology? It is difficult to come to any other conclusion apart from a sinister one. This government is trying to push through sweeping change that fundamentally attacks the vision of the NHS and the founding principles it was set up to achieve – and it is setting up these non-statutory new bodies having by-passed parliamentary debate on enabling legislation. Handing over huge contracts to single private providers with no public accountability is not something that would go down well if it were set out in simple terms. By constantly changing the name, by making it inaccessible, dry and complicated NHS England concedes that what it is doing is unpopular, but it also establishes a convenient barrier to weaken opposition. That is why Keep Our NHS Public exists: to clear the government’s smokescreen, to fight against the damage of recent legislation, to persist in toxifying the terminology and to call out these latest actions for what they are – attempts to destroy the NHS, working around current legislation, and avoiding the parliamentary and public scrutiny draft primary legislation would bring. With Health Campaigns Together and We Own It, with Jon Ashworth, Eleanor Smith, Caroline Lucas, Ken Loach and other allies we will stand against the fragmentation and privatisation of our NHS. Read here and head to our resource cabinet for more helpful documents.